Eight members to be appointed by the President of the ECOSOC following formal consultations with the bureau and regional groups through the coordinators, on a basis of broad consultations with indigenous organizations taking into account the diversity and geographic distribution of indigenous peoples of the world, as well as principles of transparency, representativity, and equal opportunity for all indigenous peoples, including internal processes, when appropriate, and local indigenous consultation processes. Members of the Permanent Forum serve in their personal capacities. They are not United Nations staff members, they are not based in United Nations offices, and do not receive a salary. The United Nations supports their travel for the annual sessions of the Permanent Forum. The current membership of the Permanent Forum will expire on 31 December 2019. Nominations are requested for the three-year period from January 2020 until December 2022. Members may serve for up to two terms. 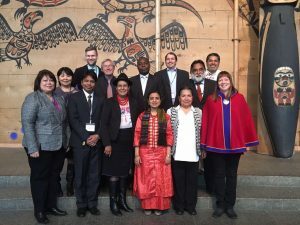 Seven indigenous nominated members are from each of the seven socio-cultural regions determined to give broad representation to the world’s indigenous peoples. These socio-cultural regions are: Africa; the Arctic; Asia; Central and South America and the Caribbean; Eastern Europe, Russian Federation, Central Asia and Transcaucasia; North America; and the Pacific. The eighth member is nominated from one of the three regions with the largest indigenous population (Africa; Asia; and Central and South America and the Caribbean). This seat rotates among these three regions every three years. (See ECOSOC Decision 2016/205, Election 2). For the 2020–2022 term, there will be two members of the Permanent Forum from Central and South America and the Caribbean, nominated by indigenous peoples’ organizations. Information about the selection process will be posted on www.un.org/indigenous once a decision has been made by the ECOSOC and its President.